Susan Walsh, an aspiring writer, go-go dancer and mother, disappeared in July 1996. (CNN) -- She was a nightclub dancer, a mother, an aspiring writer. And torn from the calendar where she kept her daily schedule was the month she disappeared: July 1996. 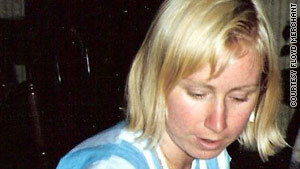 Susan Walsh, who was 36 at the time, was last seen around noon on July 16, 1996. She told her estranged husband that she was headed to a pay phone a half-block from her apartment in Nutley, New Jersey. Walsh and her husband, Mark, had been home in their connecting apartments with their 11-year-old son, who was asleep, said Detective Lt. Steven Rogers of the Nutley Police Department. "No one actually saw her leave the house," said Rogers, who became involved in the case in 2003 when he was assigned to command the department's detective bureau. "No one saw her on the phone." Walsh had just written a story about immigrant strippers allegedly controlled and exploited by the Russian mob. "This opened up a threat to her," said her father, Floyd Merchant. She believed two contracts had been issued for her murder after the story appeared in The Village Voice, said Merchant. She feared for her life, he said, and had begun drinking again after 11 years of sobriety. Now, 13 years later, the idea that the publication of Walsh's story led to her disappearance remains just a theory. "I don't believe at this point there's any connection," Rogers said. Despite her passion as an aspiring journalist, Walsh struggled to escape the lure of easy money she earned working as a nightclub dancer in the New York City metro area, her father said. She had been working in clubs for four years, in part, Merchant said, to support her son. Her dancing experience gave her access to the clubs, where she collected information for her story. "She stretched herself in 20 different directions," Merchant said. Walsh's potentially risky lifestyle fueled speculation that she vanished on purpose. "They did believe that, at one time," Merchant said. "That she walked away on her own." He said he believed his daughter's dancing discredited her with police and detracted from the investigation. But Walsh made no apparent preparations to leave home. She left behind nearly all of her personal belongings, including her purse, money and medication. Most important, police say, she left behind her only child, David. "Susan was a devoted mother," Merchant said, adding that she would not have left her son voluntarily. Rogers said Mark Walsh has never been considered a suspect. The investigation has proven difficult because some of the people involved in Susan Walsh's life have not been located," Rogers said, and others have died. Police still are searching for a second person of interest who they believe has information about the case. Rogers does not rule out the possibility that Walsh is alive. But Merchant believes his daughter's life was in jeopardy. "The last time I met her she was worried about [someone] having her killed," Merchant said. "She was coming apart at the seams." Detectives searched the couple's home a day or two after her husband reported her disappearance. Nothing led them to believe any criminal act occurred in the home. But her wall calendar, seized during the initial investigation, was missing the month of July. "To me, that's significant," Rogers said. "Did she have something planned that someone didn't want us to see?" Police say they are still investigating. Anyone with information can contact the Nutley Police Department at (973) 284-4940. "Understand that there are two heartbroken parents who need closure on this," Rogers said. "If anyone has information, or if the person who knows what happens reads this, let us know. If they are directly involved we would work with prosecutors to make sure the right thing is done."